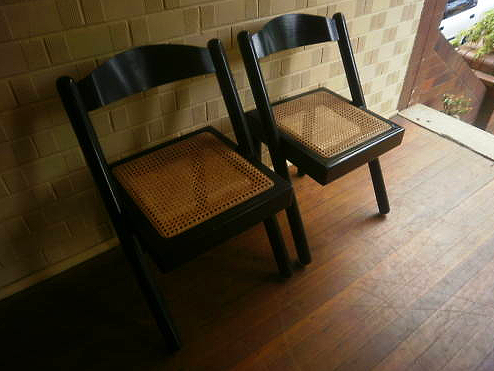 Ebay bargain of the day: "2 x black chairs with cane seat"
I rather like these... Currently $29. Pickup from Pymble in Sydney (North Shore). 7 days left. Anyone? Click to bid. Rather lovely and just up the road... however, I see those style of seats and I see tsunamis tipping up left right and centre. Far too stressful. I sat on one of those every night for dinner growing up - my Mum and Dad had 10 of these! Yes they look great. Despite and in contrast to my Swedish DNA, I am so into glossy black at the moment.. A deep love affair that is destined to last for sure.. Am in heaven here in Sweden looking at good local farmer's antiques that can be coated black and integrated with some edgier pieces when we move here next year. So much fun to be back in the old world again! Hope you are well and that you have settled in properly after the move. The post-relocation-blues can be tough..